Sasha Says Nails... I'm a Manicure Momma: NOTD: Sally Hansen Salon Effects Nail Polish Strips in Zip It! NOTD: Sally Hansen Salon Effects Nail Polish Strips in Zip It! 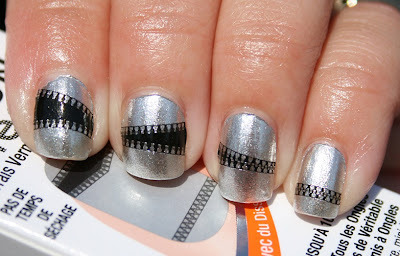 Sally Hansen Salon Effects Nail Polish Strips in Zip It! I have absolutely got to go see the movie "Rock of Ages" this week... especially since I have on another pattern from the Rock of Ages collection today. I download the soundtrack from the movie earlier today and am loving it. I already had the Original Broadway Cast Recording and it's fabulous as well. This pattern applied so easily.... I think I spent less than 10 minutes on both hands and I am so pleased with the result. For some reason the side of my ring finger nail looks lifted... but I think it's just the lighting because it's not lifting at all. So has anyone seen the movie yet? What did you think? Disclosure: The nail polish strips featured in this post were sent to me for review purposes. This post also contain an Amazon referral link. I really like this design!! Very cool! Best information on salon in this matter. Quality of the content is quite trendiest.